So I was in kind of a funky place all day vis-a-vis the whole Valentine thing. Not so much because I was feeling pressure to meet some societal standard of adequate gifting etc. The standard is self-imposed and is one that I’m comfortable with. No, the problem was that the item that I had carefully hand-selected has not arrived. And when I went online to check on its progress through life, I was informed that the website was sorry but that it could not provide updated information about whether it had even shipped, let alone where in the hell it might actually be. I was welcome to call Customer Service. I was not, frankly, in the mood to call Customer Service. So, I resorted to the next best thing which was to substitute a place-holder gift to tide The Lovely Rhonda over until the real deal finally makes it off the slow boat from China or wherever it will be coming from. Thus did the children and I hop in the van and head over to a place where such things could be obtained. Just before leaving I was struck with some kind of flash of inspiration, or maybe it was something I ate — there is a wicked virus blowing through the house, more on that later — and found myself sitting at this very keyboard tapping out a little something. …. I didn’t really steal her but it sounds better that way. And the virus? Two kids out of three so far. We would not have made that trip to the place in the van this afternoon had I realized it wasn’t just one of those things for the first kid. It hit the second one as we sat at the dinner table. Lucky us! So last night The Lovely Rhonda’s girls were getting their Valentine’s cards done for school today. My kid had already had her Valentine party at school because her teacher is off for a few days starting today and didn’t want to miss it, so they had it yesterday. We weren’t paying that much attention to what the middle child was doing with hers until she was nearly done. The Valentine’s cards she had picked out were the kind that come with a sticker that you were supposed to insert into the card so that the recipient would then have a groovy sticker as well as the card. But she was very carefully peeling every sticker off its backing and affixing it to the cards, one by one. And at that point I wanted to turn back time because now this poor kid, this poor seven-year-old kid who has already had kind of a rough evening, is sniffling and sobbing about how she did them all wrong as she very sadly finishes putting the stickers on the cards. So yeah, I felt super good about that. I just looked at TLR and said, “What is wrong with me? Why did I say that?” And she didn’t have a good answer either, because there wasn’t one. So I grabbed the car keys and said, “You know what? 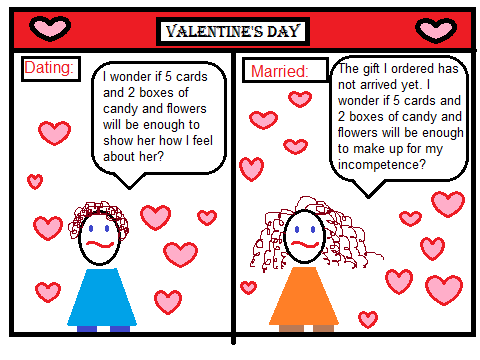 I’m going to go get you a new box of Valentines cards because I don’t want you to be sad on Valentine’s Day.” And I raced to the store and got not just a new box of cards but a box of cupcakes too. Because I made a kid cry for no reason but my own inability to shut my face. And I got some flowers for TLR because her gift has not arrived yet. This is just not my year for holidays. I kind of blew her birthday present too. After I got home I sat with the kid and she addressed them and I folded them and put the stickers inside, and everything was okay after that. This parenting thing. It’s exhausting. We actually do a little bit of celebrating of Valentine’s Day, but nothing over the top. Everybody gripes about it: its origins, the commercialism, etc. As with most things, I’m rather a moderate on this topic. Personally I think it’s kind of harmless to take a day to send little love notes around or buy flowers for your sweetie. And, nobody’s really connecting it to the saint it’s named for, just like we don’t really connect Easter bunnies and eggs to their origins either. Big deal. I think it’s a lot of butthurt for something as innocuous as this. That being said, we also kind of “have” to engage in it a little because we have three school-aged children and they do it at school. There are rules: every kid gets a card from every other kid, no playing favorites. I think this makes it fair, and you can get the little boxes of cards at the dollar store if you want. The kids enjoy it and no harm done. The Lovely Rhonda and I don’t get all crazy for it either. We spend enough time appreciating one another as it is that we don’t have to invest any special meaning into this day. It’s not the only day of romance either of us gets. Maybe it would be different if it was. But we still do a little something, because chocolate. And trinkets. And the opportunity to gross out the kids by acting like we like each other a little. Unfortunately, my gift to Rhonda has not arrived yet. In my defense, I ordered it in what seemed like plenty of time! Stupid internet. So my lawfully wedded wife, The Lovely Rhonda, has this child. This child who is five. This five year old child who is really, really five. She’s five all the time. She’s five when she gets up, and five when she goes to bed, and five all of the hours and minutes and seconds in between. Today, for example, this five-ness has manifested in several distinct ways. The morning went fairly smoothly, aside from the agonizing wait for breakfast. Really, it was grueling. I was making oatmeal and the one child in the house who does not care for oatmeal was already having her bowl of Honey Nut Not Oatmeal Cereal. This, of course, was difficult for anyone who is five to tolerate. Um Debwa. Is bweakfast weady? At this point she was cut off by her mother who notified her that this was perhaps not the most polite thing to say. Things went on more or less without incident until lunchtime. I was told that she was “starving to death” after her lengthy and eventful soccer game, and so anticipated that she might actually eat her lunch, but no. She was served a sandwich and a small amount of soup. She ate the two saltines that came with the soup and nibbled at the sandwich, guzzled the apple juice, sucked three noodles off the soup spoon and began the most prolonged dawdle that has ever been witnessed in captivity. Before either of you get excited that we have unrealistic expectations about this child’s ability to eat one sandwich and a half cup of soup, let it just be said that she is famous for eating, at most, a third of what is presented to her, no matter how miniscule this amount may be, and then declaring herself full. Thirty minutes later she will begin a tireless campaign for snacks that ends only when the next meal is served. She will make endless plaintive cries of “But I’m hungwy!” and act as though we are starving her, perhaps in between beatings. She will repeat this at each meal regardless of whether a snack was provided or how long it has been since she last ate. So, it’s not like we never feed her and it’s not like we demand that she eat endless platefuls of food. We would just like her to make the effort to consume something resembling a reasonable amount of food at a meal such that she is adequately nourished for, say, more than an hour. Today she dragged this mealtime torture on for close to ninety minutes. At last she finally ate the sandwich and the soup. If she asks me for a snack in an hour I will grit my teeth and try not to break whatever I happen to be touching at that moment. Wish me luck. All of the children have been mandated to clean their rooms today and she is no exception. To her credit, she is better about this than when she was four. When she was four she would act as though we were lighting her on fire if we requested that she begin putting a few toys away while waiting for an adult to assist her. She would sit on her bed and scream like we were beating her. Now she just dorks around in there until someone comes and tells her to pick up five toys and put them away. It’s not any more effective but at least it’s quieter. Today she went to her room as directed after lunch and, inexplicably, emerged a few minutes later wearing only underpants. I had thought she wanted to perhaps change out of her soccer clothes, although this did seem out of character, but I was trying to give her the benefit of the doubt. She went back into her room and when I went to check on her had put the same clothes back on and was sitting on the floor with her knees stuck under her shirt stretching it out. We had already been through this at the table, because obviously if you’re going to displease the wardens by going on a hunger strike the thing to do just to make it worth your time is to stretch your brand new soccer shirt out of shape while sitting at the table. So, I now required her to hand the shirt over and put on something less appealing, i.e. not her brand new soccer shirt but just any old regular shirt out of her drawer. Oh, the humanity. Clearly I am the meanest person in the world. UPDATE: As predicted, ONE HOUR LATER she asked me for some fruit snacks. I managed not to break anything. But she didn’t get any @#$&ing fruit snacks either. OMG.